I t isn't going into space that has you reaching for the Dramamine. Before NASA retired the shuttle, it had gotten to be almost routine. There's just something about being dropped by the cargo plane in midair. Those moments of free fall before the cable catches you for the real trip to space are nerve-racking, not like being in orbit at all. The loud metallic clashings don't help. The passenger capsule is being locked securely to the flatbed SST that will carry it to the edge of space; the streamlined fairings are being latched into place. It still sounds as if the capsule is being battered apart. At the front of the 20-meter-long capsule, the crew sit in their tiny control room; they won't have much to do until the transport plane falls away and they maneuver to meet the cable's grapple-craft when it drops in from space. Around you, the 29 other passengers in the full capsule sit and fidget. The Mach-3 trip to the space elevator is about to begin. It was Konstantin Tsiolkovsky, the Russian space pioneer, who first understood that multistage rockets could carry us into space. Years after his death, this insight brought him fame as the Father of space travel. 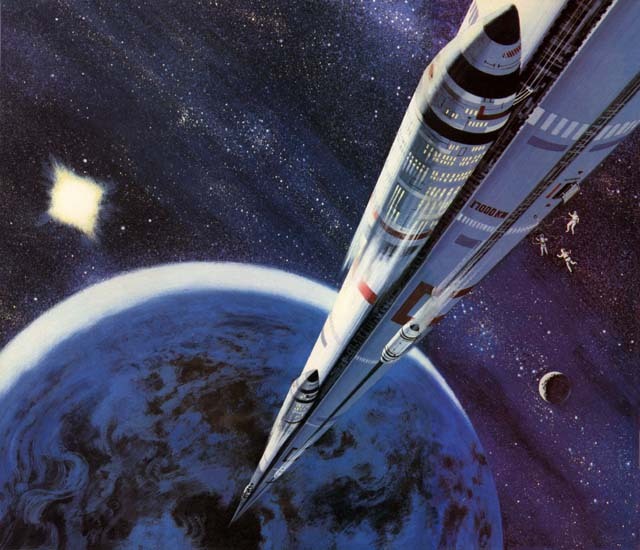 But few people remember Tsiolkovsky's second idea: Someday, he said, we might erect a skyhook, a cable into space, and climb it as we would a beanstalk. Years later Yuri Artsutanov suggested that a shorter cable, rotating around its midpoint, might hurl objects into space like David releasing a stone with his sling. Now that we are accustomed to rockets, these concepts sound outlandish at best. Yet practical-minded engineers are starting to take a closer look at them. Trouble is, rockets are expensive and wasteful. Most of their fuel goes to prevent them from falling; relatively little actually carries them farther from Earth. The space shuttle is reusable, and so it cuts our equipment costs. Still, it uses up a lot of fuel. For really cheap space transportation, we'll have to do away with rockets entirely. The skyhook, or the rotating space elevator, could be what replaces them. Some 36,000 kilometers out, we have put dozens of satellites into so-called geosynchronous orbit. At that distance, it takes a satellite 24 hours to complete its orbit, exactly as long as it takes our planet to rotate underneath it. On Earth, it looks as though the satellites stay fixed in the sky above the equator while the stars slowly pass from east to west. Suppose one of those satellites carried a cable-making machine. If the cable were strong enough to support its own weight, it could extend all the way to the surface. For balance, the satellite would extrude another cable upward. The cables would be tapered, thin at the ends and thicker near the satellite, to support the weight below and counteract the centrifugal force above. At full length, the upper cable would be 110,000 kilometers long. If the extrusion rates were carefully controlled, the pull of the cables on the satellite would cancel out and the cable machine would remain in synchronous orbit. The bottom end would eventually be attached to the ground, the outer end to a counterweight, probably a small asteroid. Gravity and centrifugal force would hold the cable exactly vertical. Theoretically that's all there is to a skyhook. But an Earth skyhook would be an engineering marvel. Building the 36,000-kilometer-long segment down to the planet would be equivalent to erecting a suspension bridge around the equator. To finish the section in five years would mean building 20 kilometers of cable each and every day. And to lift appreciable loads, say 100 tons at a time, the skyhook would have to weigh 600,000 tons. To get up the cable, we'd use electric cars. For smaller cables, they would climb up the outside. For a greater carrying capacity we might arrange several cables in, say a hollow square. The cars would then climb inside the structure like a standard elevator inside its shaft. To make their trip in six hours or less, the cable cars would have to travel at 6,000 kilometers or more per hour. At that speed, rubbing or rolling contact would cause an instant catastrophe; the cars would be propelled by magnetic levitation instead of by wheels. Each car would consume only a few dol lars' worth of electricity per kilogram--far less than the cost of rocket fuel. If a car traveled beyond the central station in geosynchronous orbit, it would be pulled along the cable by centrifugal force, like a skater at the end of a crack-the-whip. The cars would have to brake to keep from flying out too fast. If the brakes were used to turn a generator, they could provide energy to raise the next cable car. And you would want to go out beyond the central station. As the cars climb, the cable's rotation would carry them horizontally through space at ever higher velocities. An object dropped from the cable during the first few kilometers of the trip would fall nearly straight to the surface. As the car climbed higher, the impact point would migrate eastward. Dropped from 25,000 kilometers or beyond, the object would shoot past Earth's horizon and go into orbit. At the central station, 36,000 kilometers out, skyhook payloads could simply be floated out of the car to become synchronous satellites. But move still farther out: At the ballast stone, the cable car would be 150,000 kilometers from the center of the earth and moving horizontally at 11 kilometers per second. Let go of the cable, and the car--now turned spacecraft--could coast all the way to Saturn on a minimum-energy orbit. The trip to all the nearer planets would be much quicker. It may be a long time before we can build a skyhook here at Earth. The skyhook would require an unusual material, something both strong and light. Even the best steel would be too heavy for an Earth-based skyhook. But crystalline graphite could handle the load. In theory it is 20 times as strong as conventional steel, yet only one fourth as dense. A cable one centimeter square with the strength of crystalline graphite whiskers could lift 210 tons here on Earth. Partially crystalline graphite fibers in plastic are the wonder material of aerospace and sports-equipment manufacturers. Their high strength and low weight make them ideal for tennis rackets, golf clubs, and the like. And the space shuttle's main engines are extremely light because they were built using graphite fibers wherever the temperature would permit. A crystalline graphite cable one centimeter square would weigh about 220 kilograms per kilometer of length. A piece nearly 1,000 kilometers long could support its own weight in Earth's gravity field. If the cable. were built with a taper, thicker at its supporting end, it could be much longer. With a taper of ten to one, a graphite cable could be built all the way to synchronous orbit and beyond. But for the moment we don't know how to weave large graphite cable with the strength of tiny whiskers. Today's graphite fibers are strong, but only one tenth as strong as theory postulates. Even at that, however, they are more than strong enough to build skyhooks on the moon and Mars. A skyhook for Mars would be far easier. Mars rotates nearly as quickly as Earth, once every 24.5 hours, but its gravity is less than four tenths as strong as Earth's. A skyhook at Mars capable of lifting 100 tons would mass only 4,200 tons. Mars even offers a 21-kilometer-high mountain, Mons Pavonis, on the equator, and a small moon, Deimos, in almost the right orbit to act as a counterweight. And the new version of the skyhook, the space elevator, uses a much shorter cable that should be still easier to build. The space elevator rotates in orbit, the ends of the cable touching down near Earth's sur face. One design calls for a cable 8,500 kilometers long, its central portion circling the earth every 183 minutes, in an orbit 4,250 kilometers high. The long cable would rotate once every 122 minutes, like two spokes on a bicycle wheel, with the imaginary rim rolling along the surface below. Three times each orbit, once every 61 minutes, one end of the cable would touch down into the upper atmosphere. These entry points would be the elevator's ports of departure. The bodies involved are so large that the ends of the cable would seem to come down nearly vertically without wandering horizontally. But there is more to it than a rigid cable. Under maximum load, graphite could stretch by nearly 2 percent of its total length--about 80 kilometers for the section of cable out to the midpoint. This means that a coupling vehicle could fly the cable's end to the rendezvous ahead of its nominal touchdown time and delay its return to orbit. This would allow almost a full minute to meet the transport and to exchange capsules carrying cargo and passengers. The three-touchdown space elevator would need a taper of about 1 2 to 1. A cable with a mass of only 7,500 tons could lift a 100-ton cargo into space. At touchdown, the end of the cable would approach and leave Earth at 1.4 gravities--not comfortable, but a much gentler ride than astronauts endure on the shuttle. It would be even more practical on the moon. A lunar space elevator could be made with materials like the super plastic Kevlar, which has about five times the strength to weight of steel. Kevlar is now used in such products as bulletproof clothing, radial tires, and parachutes. A 3,700-ton space elevator at the moon could lift and deposit 100 tons every 20 minutes, subjecting payloads to a maximum acceleration of only 0.66 gravity. Rotating space elevators could be used on any of the solar system's moons. Jupiter's Ganymede and Saturn's Titan are larger than Earth's moon, but a Kevlar space elevator with a taper of six to one could serve either of them. Spinning cables orbiting the sun between the planets could act as shuttle points, cutting the travel time between any two places in the solar system. Instead of going slowly off to a distant planet on a path calculated to save energy the capsules would head at high speed to the nearest transfer cable. Approaching the cable, they would attach themselves to the point along the spinning thread that matches their approach velocity then move along the cable to a point with the velocity needed for the next leg of their journey After a short wait for the cable to rotate toward the departure point, the capsule would release itself from the cable, flying into space toward its goal. The trip would be free. The cable would slow a bit as its energy was carried off by the disappearing capsule, then regain the speed when the capsule returned. As long as more mass dropped inward toward the sun than went out into space, the space elevator would need no energy source once it had been set in motion. Graphite fiber technology is developing so rapidly that a rotating space cable will soon be feasible. Shortly after that, we may be able to make cables strong enough to weave a stationary skyhook. Scientists are planning some shuttle experiments with tether cables up to 100 kilometers long. After that, longer cables will come. Someday we may even see an international race to spin the first cable into space. Well beyond the 50-kilometer altitude that once separated airplane pilots from astronauts, the cargo plane releases its latches and drops away as the passenger capsule soars on. If anything goes wrong, the capsule's parachutes will get you safely back to Earth. Overhead, the grapple-craft at the end of the space elevator dives downward to rendezvous, its control jets flashing to position it for pickup in order to exchange an incoming capsule for yours. Carefully taking their time, the crew attach the grapples to the lifting lugs atop the passenger capsule. Upward acceleration slowly replaces free fall, and the weight comes back onto your belly--just in time. In half an hour you are 260 kilometers up and moving at 9 kilometers per second. The grapples release, and again you are in free fall. It will be 12 hours before you get to the moon.